The morning was not kind to the Open Women’s leader at the Ed Headrick Hall of Fame Classic. Catrina Allen brought a three stroke lead into Saturday morning but saw Paige Pierce catch her by hole 4 after picking up two early bogeys. Pierce took the lead outright by hole 6 before each player cooled off through the middle stretch of the course. It was Allen that took control late to regain the top position and finish the day with the same margin she started with. Timely birdies on holes 14-16 were the difference makers to help Allen to her second consecutive round over her rating. Through two rounds, Allen leads the competition in parked shots, birdies, and both Circle 1 and Circle 2 in regulation. She stays in first at 1-over par 135 total with Saturday’s 2-over par 69. Pierce matched Allen’s 2-over par 69 and is in solo second at 4-over par 138 total. 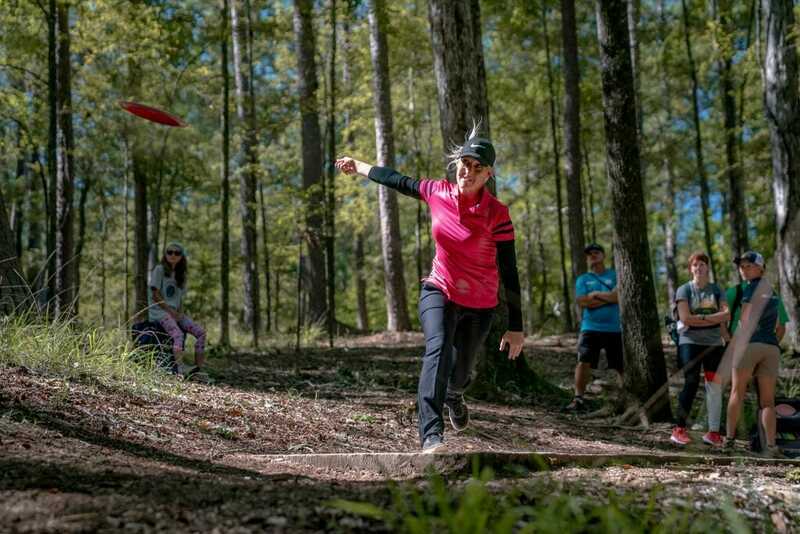 In a way we are not accustomed to seeing, Pierce currently leads no UDisc Live statistical category, although she is second in five, including Circle 1 putting, which has been her biggest barrier in the past. Ranking 13th in the division in fairway hits on a course that requires placement isn’t going to cut it, however. It’ll take either a major collapse from both Allen and Pierce, or a scoring effort from the field we’ve yet to witness for another female to come from behind for the win. Elaine King, Sarah Hokom, and Jessica Weese are tied in third at 9-over par 143 total, five strokes behind Pierce. Curiously, all three women in third were also tied for third after one round. The lead card of Allen, Pierce, King, and Hokom tees off on W.R. Jackson at 8:50 a.m. local time. Follow along on UDisc Live and watch next-day coverage on the Disc Golf Guy YouTube channel. Comments on "Late Turkey Helps Allen Maintain Hall Of Fame Lead"